Zorains Studio About Zorain Khaleeli Right from the age of 15 Zorain Khaleeli has loved the art of Makeup and has ever since perused this passion. 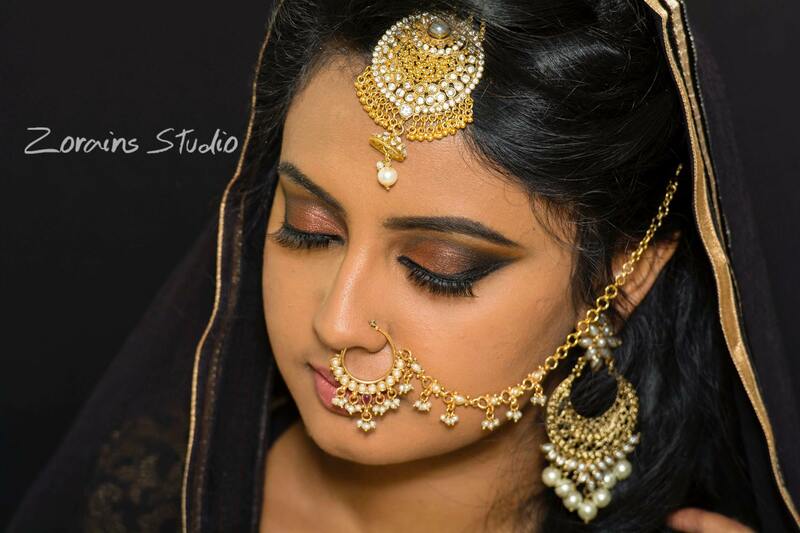 Her journey started very much in her home town of Bangalore, with the focus on brides and photo shoots. Which carried on after her marriage to the country of Oman. It was there that she got an experience to the world of the Arabic style eye. On coming back to Bangalore Zorain Joined Mac in early 1997, with their first flagship store in Bangalore soon to move on to head training for south India and finally moved to Dubai to head a country as Training Manager having trained hundreds of budding Makeup artists. Through this enriching period she has had the opportunity to work very closely to the common women, understand their needs and adapt the make up to their requirement. She believes "Being on the counter every day at a Cosmetic store not only help you suggest the right make up but is also a great experience as every day is a new day with new people and different eye shapes and face shapes to work with. There is no better training school that this" She has been a part of over 12 seasons of the Indian Fashion Week, India's most premium fashion week with many more shows that include, Couture weeks, Blenders Pride Fashion Weeks etc working with the top model like Noynika Chatterji, Carol Gracious, Saniya Sheikh, Netra Raghuraman, Racheal Byros to mention a few. She has also had the opportunity of being back stage artist at the IIFA Awards, the GIMA Music awards and the 100 years of Kannada film industry celebrations catering to the Film Fraternity and working with a host of Bollywood and Tollywood actresses like Zeenat Aman, Shraddha Kapoor, Shruti Hassan, Shiddharth Malhotra, Suniti Chauhan, BipashaBasu, Kangana Ranuat, Kriti Shanon, and more local Kannada film industry with Ramya, Sharmila Madre, Andrita, Shruti Hariharan Jennifer Kotwal etc. Her inspirations have been both from International and Local Make up Masters like Kevin Aucoin, Charlotte Tilbury, Tony Reberio, Tom Pecheau, GordanEspinet and Terry Barber and nationally she has drawn her inspirations from Mickey contactor who she has been able to work with for over 8 years. Zorains Studio is part of a larger dream to become India largest Chain of Premiere Make up Schools and Service provider. "Makeup is like magic.. It's those hidden small tricks that can amaze your mind and change what you see." Advance Airbrush Makeup Course At Zorains Studio we are professionals , life changing team that exceeds expectations. We are innovative and passionate individuals, always seeking advanced knowledge while caring for our community and or earth. Learn airbrush makeup techniques to give flawless look to your cleints. Join this course at Zorains Studio, Domlur, Opposite Dell, EGL, Bangalore.